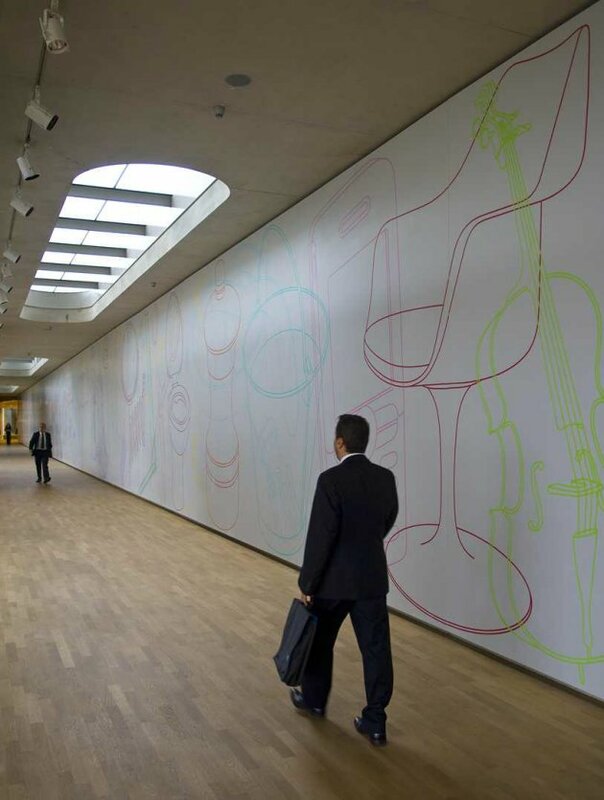 British artist Michael Craig-Martin has created two large scale artworks for the new building of the European Investment Bank (EIB), choosing as his medium the expressive versatility of DuPont Corian. Located in the Kirchberg area of Luxembourg, the East building extension is linked to the EIB’s existing headquarters, expanding the available workspace to 72,500 square metres. 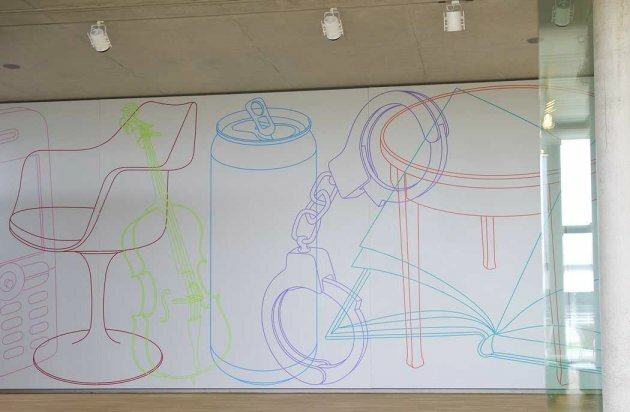 Renowned for his use of bright colours and images of everyday objects to elevate public spaces into works of art, Craig-Martin has produced two installations for EIB. 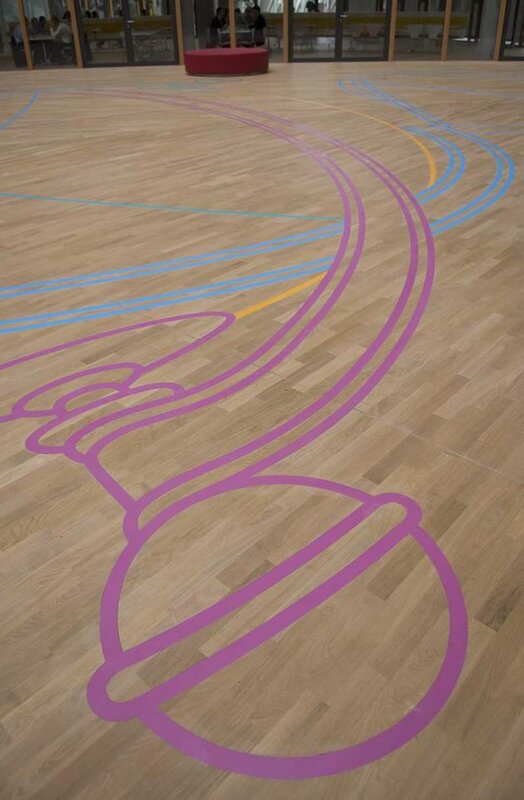 These are an 88m long “painting” titled “Parade” for the staff cafeteria, and a “sculpture” set into the floor of the building’s main atrium titled “One World”. 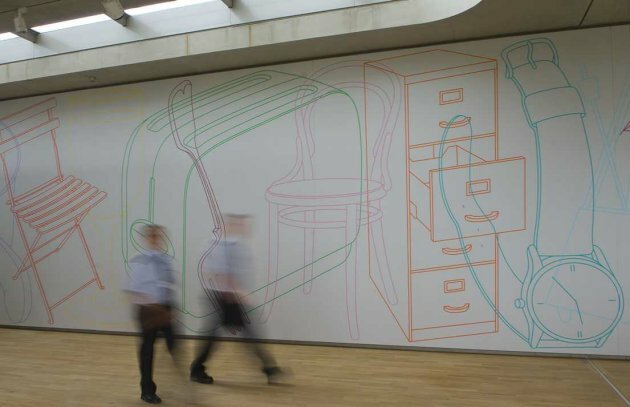 Both works exploit the exciting creative properties of Corian, using inlaying and marquetry techniques, and a range of specially-developed vibrant colours, to create intricate line-drawings on an immense scale. “Parade” is an 88m-long by 4m-high installation that covers the wall joining the bank’s older west building (designed by Sir Denys Lasdun in 1980) to the new East building (designed by Ingenhoven Architekten), forming one side of the cafeteria space.The largest work ever produced by Craig-Martin, “Parade” is a compendium of more than 60 different images of everyday objects – from a shoe to a piano, a football to a fire extinguisher. These overlapping images are “drawn” in 20 different bright colours of DuPont Corian against a background of Corian in Cameo White. The modern marquetry technique, used to fabricate “Parade”, involved employing CNC machinery to carve out the outline of the images precisely, and then gluing thin strips of DuPont Corian into the grooves. 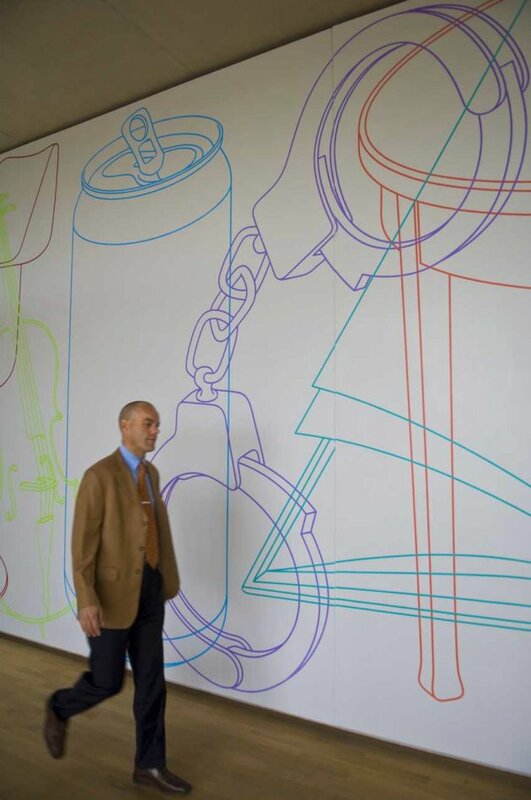 According to Thierry Delles, owner of Créa Diffusion, the sheer scale of the installation was the biggest challenge. “Making each section required eight sheets of DuPont Corian to be joined together onto a frame, and these panels – each weighing 650kg – then had to be lifted by crane into the cafeteria building,” he explains. 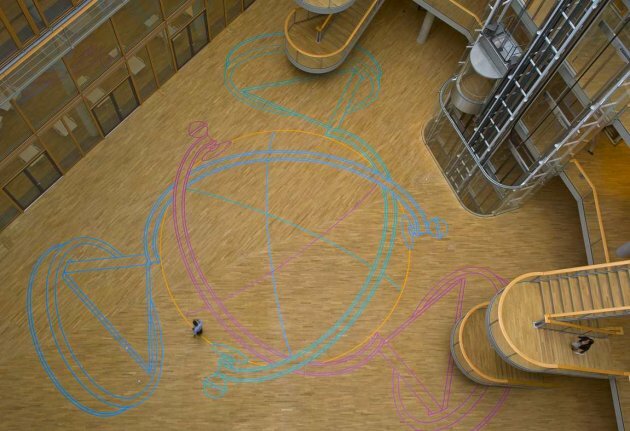 “One World” The atrium of the EIB presented a particular challenge for Craig-Martin. 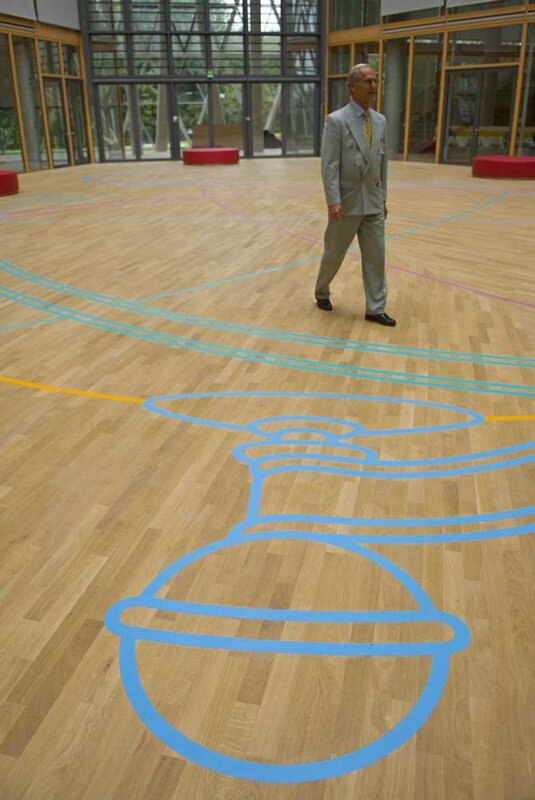 On the one hand, he says, this dramatic central space – through which staff and visitors pass daily – asked for a “sculpture”, but on the other, the floor space needed to remain open for functions and window cleaning. 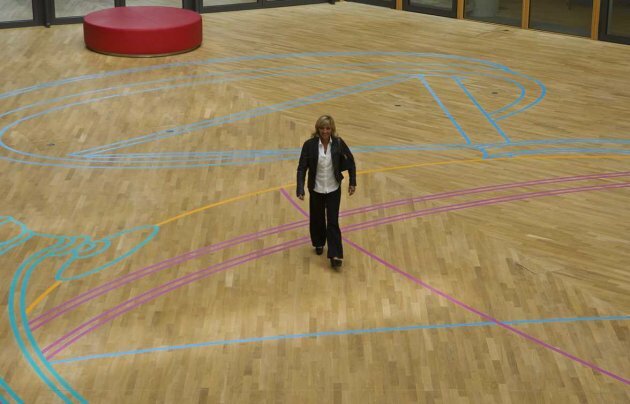 The solution devised by Craig-Martin is a “sculpture” set into the floor, leaving the floor space completely free, and visible from every level and every location in the atrium. “Although it is enormous and visually dominates this complex space, ‘One World’ is a sculpture that takes up no room,” explains Craig-Martin. The fact that Corian could be made in almost any colour was another important factor. Requiring bright, strong colours in a greater number than were available in the standard colour palette of around 100 hues, Craig-Martin asked DuPont to develop some entirely new colours for use in the EIB project. 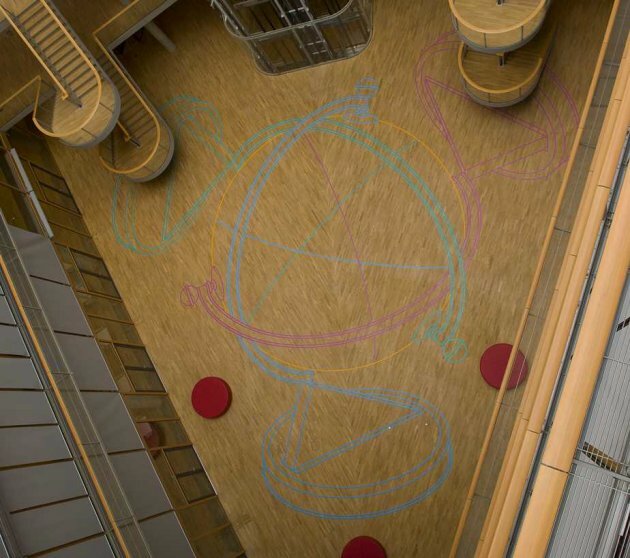 The theme of globes was an obvious one for the design’s location at the hub of the international banking environment, although symbolism was not Craig-Martin’s primary objective in proposing this image. “Although my work is based on the use of easily identifiable representational images, I have no interest in symbolism or narrative,” he says. “However there are occasions when a single image can be seen in a specific context to make an indirect but irresistible reference. I saw the globe as such an image in relation to the work of the EIB.” The simple, almost child-like image actually consists of three globes, overlapping in such a way that they share a single sphere, as though the structures of the globes are rotating around the sphere. Craig-Martin says: “I hope the image reminds people that no matter how many ‘worlds’ there seem to be, there is, in fact, only the one we share.” Craig-Martin has dedicated “One World” to his father, who was an economist at the World Bank, which meant that the commission from EIB carried a special symbolism and source of inspiration for the artist. “I felt it apposite to pay tribute to my father’s dedication to a development bank, through my own modest contribution to a peer organisation,” he says. Craig-Martin concludes: “Though designed for the same building, these two projects hadcompletely different criteria in terms of the space they would occupy and the function they would perform: while ‘One World’ is about immediacy and impact, ‘Parade’ is about gradual unfolding over time. 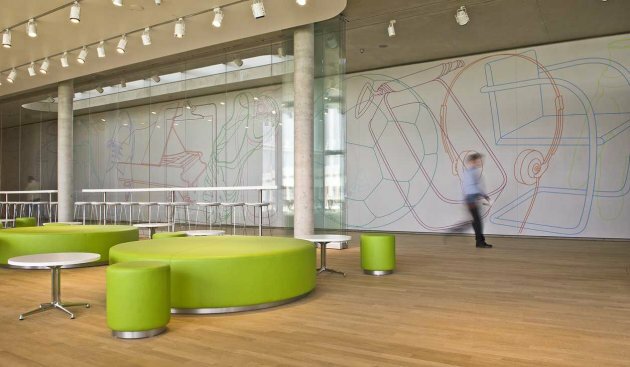 Both demonstrate the special characteristics of DuPont Corian and the many possibilities they offer for work in this zone that bridges art and design.““The way DuPont Corian has been used in these designs demonstrates how expressive it can be in artistic terms and how much emotional warmth it can bring to public buildings. We are delighted to have been able to collaborate with Michael Craig-Martin on this project.” says Jean-Yves Bach, director of DuPont Building Innovations business for Europe, Middle East and Africa.